2008 April « GASTHAUS: got 'kraut? 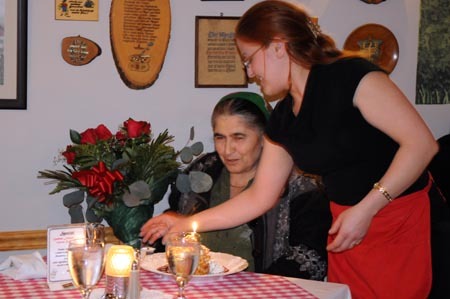 Tonight Sylvia, one of our staff members, surprised her mother with a bouquet of red roses and a dessert with a candle for her birthday. To top it off Sylvia had bought her mother a golden ring with a red stone. She was visibly surprised. 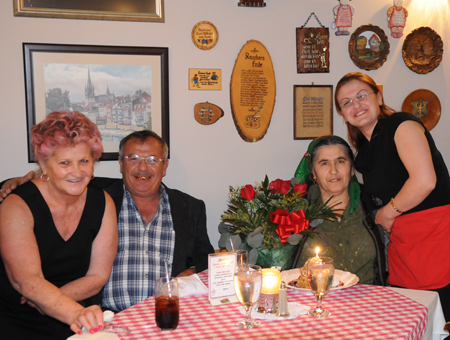 Sylvia’s parents and family came to the States from Russia. Robert and Kelly came to visit Louisville last weekend to finalize some last wedding plans. His sister Nina took the opportunity to shoot some fun engagement photos of the two. 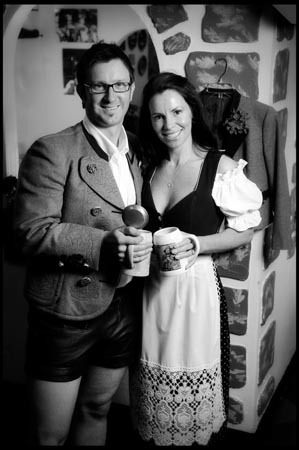 It was their idea to pose in traditional German clothing: Robert in Lederhosen and Kelly in a Dirndl. Looks like the two are ready for work!! 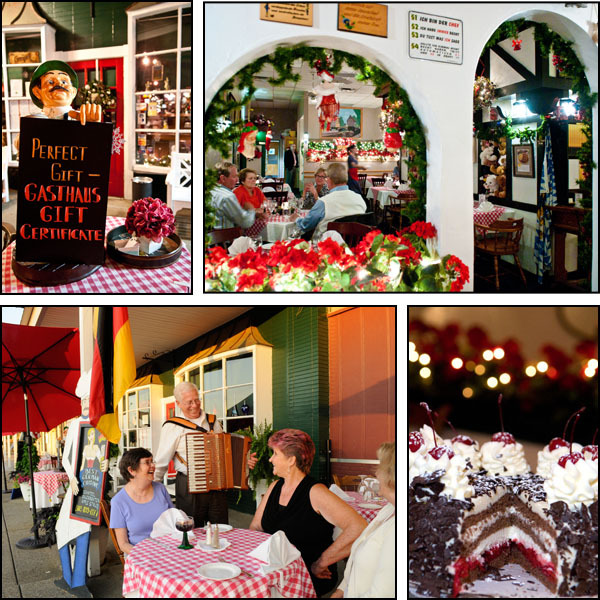 The Gasthaus will be closed on May 9 & 10, 2008 for the wedding of Robert Greipel, the owners’ son, and his beautiful fiance Kelly Corneiller. We apologize for any inconveniences this may cause. 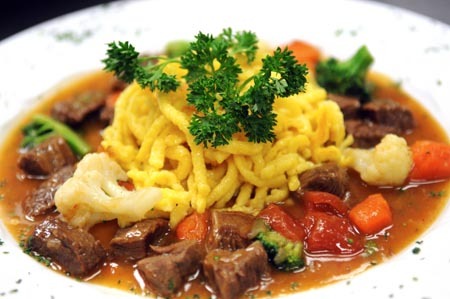 Our new dinner special is the Gemuese Fleischtopf or a German Beef Stew. Tender cubes of beef are cooked in a rosemary red wine sauce and vegetables such as tomatoes, cauliflower, broccoli and carrots. It is served with Spaetzle, our home-made noodles. Our new Chef Salad is Asparagus Salad. 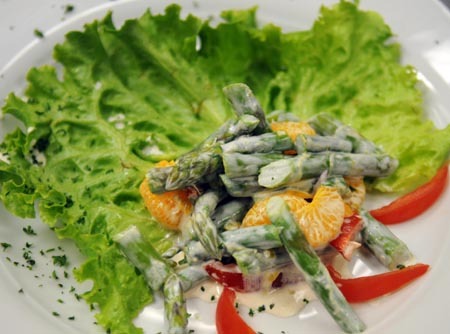 We cook garden fresh asparagus a la minute right before it’s mixed with tomatoes, mandarin oranges and red onions. It’s tossed in a sour-cream dressing and served on top a bed of lettuce. Sorry, for the delay, but we’ve been busy serving our new special soup: Sauerkraut Soup!!! It’s been a hit with our guests!! It’s a brothy soup with Sauerkraut, potatoes and smoked pork loin. And in case you didn’t know, Sauerkraut is an excellent source of Vitamin C.